Aluminum Cans: It takes 95% less energy to make a can out of recycled aluminum and produces 95% less greenhouse gases. 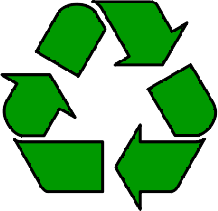 Plastics: Recycled plastic can be made into a number of products, which reduces the need for virgin materials. Paper Products: Every ton of paper recycled saves 17 trees. Break down your Cardboard Boxes and recycle them with paper! These boxes will be sorted and recycled appropriately off our campus. Glass: Recycling glass reduces waste, saves energy, and conserves natural resources. Electronics: Electronic recycling reduces the amount of hazardous materials that may enter our environment.